Kitchen as a space module, over the years, has been shifting around the dwelling. The shifts have occurred due to technological changes inside and outside the kitchen. These compulsive changes, have altered the nature of all other units of dwelling, except the bedroom. The interrelationships between the units of dwellings have been reset many times. Some new ones have become evident, whereas others have separated, merged with others, or just perished. The kitchen is an intensive activity area, and so in comparison to the entire house, its dependence on outside resources is more acute. The perimeter of the kitchen thus becomes the prime location of touching the outside connections. A kitchen can never be a centric place in the dwelling, though a hearth was such a facility. The outside connections have occurred due to supplies of fuels, commodities and water, disposal of effluents and other wastes, ventilation for replacement of air and moisture, and view out as a relief from long duration occupation. A ‘Kitchen’ consists Four main zones, storing, food processing area, cooking zone, and dining area. There could be other smaller identities such as fuel storage, water storage and kitchen utensils cleaning, laundry area, bathing area (in some ages and cultures), servants’ area (sleeping-resting). All these could be within an architectural space or in segmented form. The kitchen has been grounded or placed as a dungeon. In urban centers, this arrangement has not been possible in multi floored dwellings. 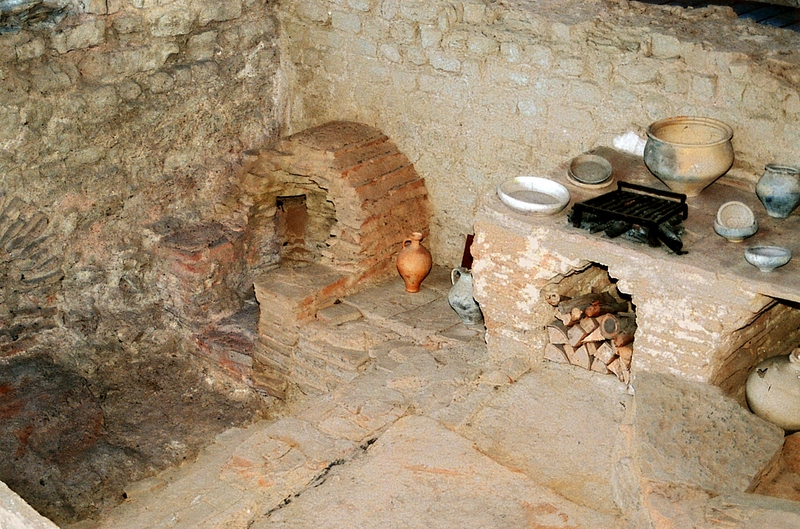 Kitchens in Roman apartments on upper floors (such as on third or fourth floors) were not workable. Here the water, fuel and commodities supplies were difficult and disposal of solid waste more problematic. Romans relied more for foods on bakeries located at ground floors and for bathing used public toilets. The Parisian apartment or London raw house kitchens opened to backyards, not a place worthy to open out, through a window or door. In both types of cases, supplies were difficult to manage. Fuel and water supplies due to the bulk, and effluents and solid wastes have been irritants for kitchen arrangements. Every technical innovation, such as compact and high efficiency fuels, piped supply of water, drainage system, chimneys, glazed windows, has been readily accepted. The dining, wherever possible, was first to be separated from the smoke-odour filled and soot-covered kitchen. The kitchen-dining could stay apart wherever servants were available and affordable, or had to be adjunct spaces. Similarly cloth and utensils washing became adjunct spaces. Bathing, which was part of the kitchen in colder climates, moved away. A kitchen gradually became increasingly dependent on the outside world as supplies became diverse and more frequent. Urban kitchens depended on fresh and day to day supplies that were partly processed. These reduced the size of food processing area, wastes volume, fuel requirements, manpower needs and time involved in cooking. With smaller spatial requirements or more attuned space arrangement, the kitchen became a place to participate with a maid then delegate it to the maid. This also resulted in better recipes (rational processes) and quality of food. The participation in cooking and related processes in a cleaner kitchen brought back the dining (at least breakfast, quick tea) to the kitchen. Participation by various members of family has seen many different trends. The modern age has offered outside work opportunities to women, resulting in much more intense sharing of the kitchen related responsibilities by other family members. The trend has been supported by kitchen design, gadgets, feeder and other services, pre-processed foods, and most importantly the fast food joints restaurants, and work place catering.